Make Your Own Pasta At Balboa! 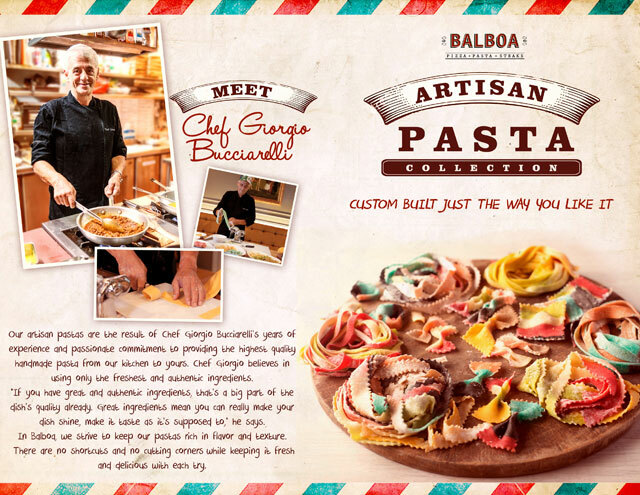 If you’re looking for a new pasta experience, head on over to Balboa and customize your own dish! With their Build-Your-Own Artisan Pasta promo, you can create your own delicious and Instagram-worthy masterpiece. Step 1: Decide if you want a single dish (P198 for 200 grams) or something to share (P599 for 600 grams). Step 2: Choose your pasta flavor. They have spinach (green), tomato (red), squid ink (black), and saffron (yellow). If you want to try all at once, go for the rainbow-colored, multi-flavored pasta. Step 3: What kind of noodles do you prefer? Among the choices are linguine, tagliatelle, spaghettini, and farfalle (ribbon-shaped). Step 4: Pick your sauce! Aglio Olio, Puttanesca, Boscaiola, Bolognese, Alfredo, or Pesto. Step 5: Add toppings: grilled chicken, wild mushroom, parma ham, shrimp, meatballs, and truffle oil. Balboa is located at the 3F Greenbelt 3, Ayala Center, Makati City or at the 5F East Wing, Shangri-la Plaza Mall, Mandaluyong City.